I have been making a lot of large batch recipes that are quick and easy lately. Graham and I have been very busy this summer and have loved having healthy large batch foods around the house. 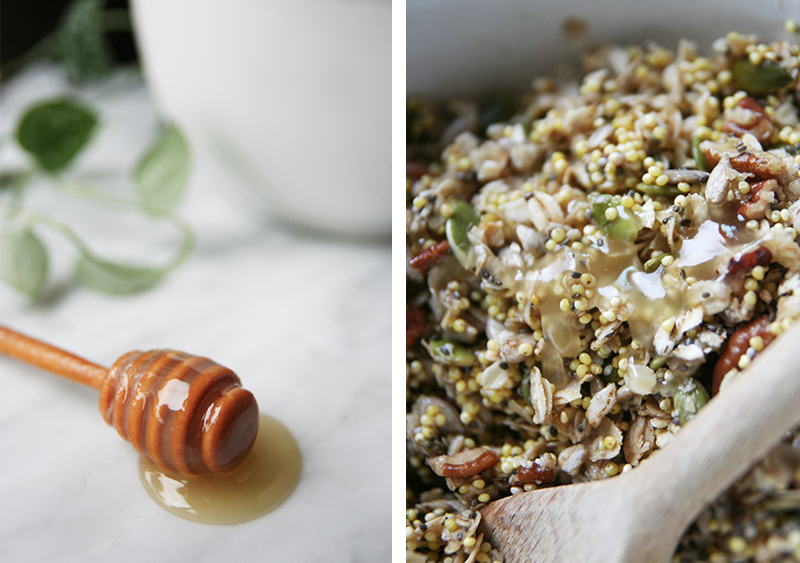 This Honey Toasted Seed Cereal recipe was created and I have been playing with it all summer long, it is very easy to adapt to what you have on hand. Since I am allergic to almonds, so I did not include almonds but I am sure they would be delicious in this as well! If you have a nut allergy like me, and are allergic to pecans, feel free to leave those out. When purchasing your honey, I recommend going to your local Co-op or health food store and asking the specialist there on which honey they recommend. Even better, is to go to your local organic farmers market and chat with your local beekeepers! It is important to purchase local honey because they typically have “organic” practices, which the bees are consuming pollen from plants with less herbicides and pesticides and other harmful chemicals. Buying local also helps to promote your local agriculture economy and beekeepers who help to protect the health of our local pollinating bees. Keeping bees local to help with local pollination is the most sustainable practice. This helps to keep our system how nature intended. If you consume honey, which you should, start supporting your local beekeepers. 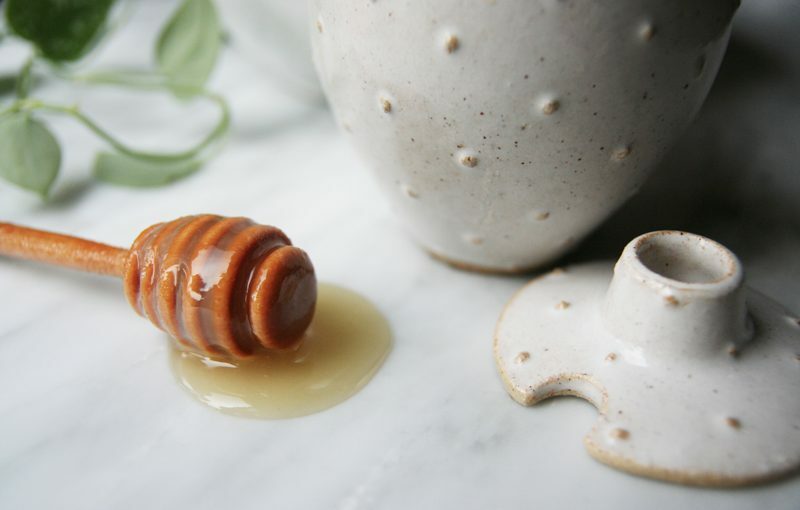 Let’s talk a little bit about why it is important to be eating honey.. there are a lot of opinions flying around out there, but at the end of the day, everyone agrees, honey is awesome and you should be using it. One thing that you maybe did not know, honey does not go bad. Honey contains very little water, so it is difficult for bacteria to grow and make the honey go rancid. There is no need to refrigerate your honey too and it is best kept away from heat and sunlight. I use a honey jar made by Fringe & Fettle that I just love! Honey can offer amazing health benefits and nutrients unlike most sweeteners. Graham and I have mostly switched all of our sweetener intake to either raw honey or pure maple syrup. I haven’t felt better, and my body is at its natural weight – and I still get to enjoy some sweets! Honey has also been known for helping with allergies, although this is not scientifically proven. I am not an expert, but if you are consuming honey in hopes of helping to relieve allergy symptoms I would do a little bit of research and maybe try bee pollen! There is a lot to learn and read about the different opinions on the health benefits of both honey and bee pollen. I encourage you to try them both and see what you think. This recipe is really fast and easy to make and I love when it is waiting and ready for me in the morning to enjoy before a busy day! I hope you enjoy this recipe as much as I do. This recipe is so easy to make and fills your home with amazing fall scents of cinnamon, cardamon and toasted seeds. I like to have some of this in a jar ready for a quick breakfast or afternoon snack. 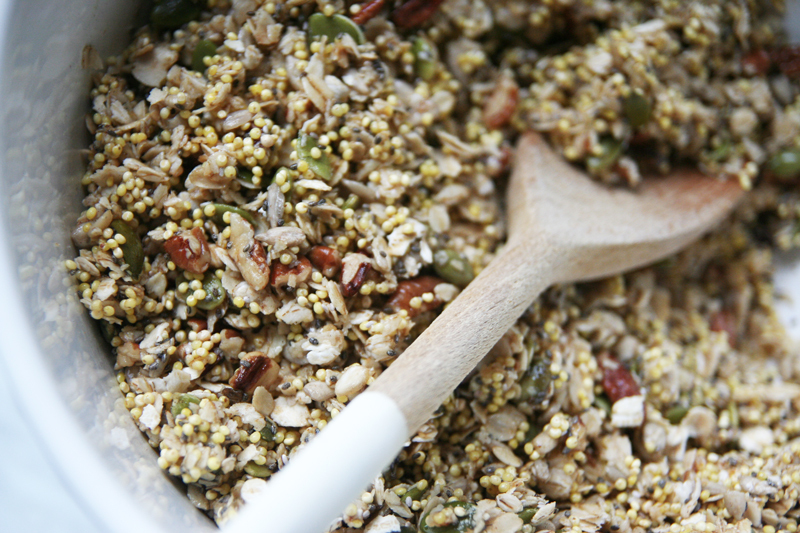 This can be served like granola with coconut yogurt or cereal and with nut milks. 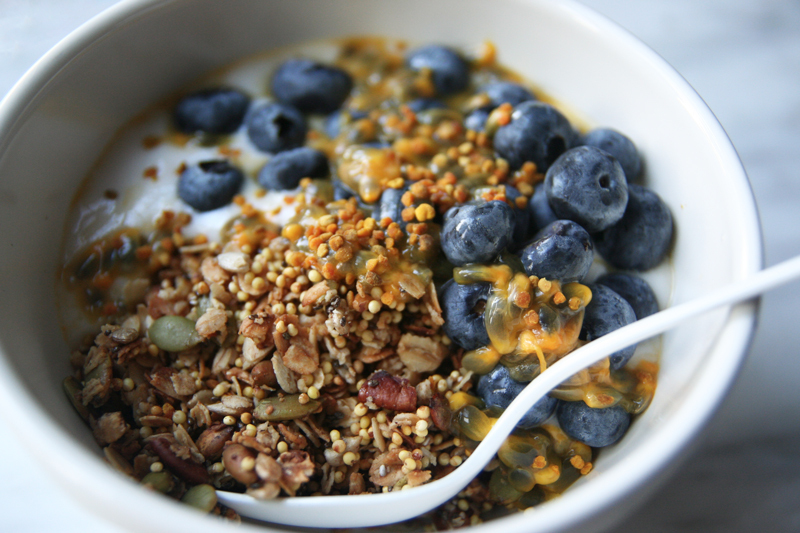 We used coconut yogurt, blueberries, passionfruit and bee pollen for toppings. Preheat your oven to 350 degrees F. Mix ingredients in a large bowl and pour honey over the top last a little bit at a time. Mix together with a wooden spoon and try to get your honey to cover all of your seed bits. Cut a piece of parchment paper the length of a lipped baking sheet and place. Pour mixture and spread it across your pan. Toast your cereal mixture in the oven for 15-20 minutes, and toss and mix cereal every 5-7 minutes being careful not to burn. Set aside to cool for at least 20-30 minutes before storing in a sealed jar or eating.